He could beat a man to death with that phone. This following "upgrade" is really more of a modification. It serves no useful purpose other than being really cool. But isn't that all you need? I decided that the Motelona just wasn't quite HEAVY enough. 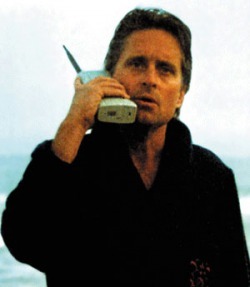 A brick phone like this should have a good solid weight. You want to pick it up, and know with absolute certainty that it's packed full of heavy circuits and electronic doo-dads. A brick phone, by definition, is heavy. So I wanted to add some weight to it. It's only about a pound or so as-is, but I wanted to make it even heftier. Inside the phone it is mostly empty, since it's a small circuitboard inside a much larger, empty case. I looked around for something heavy, small, flexible, and that would also not rattle around inside the phone. Not coming up with anything like that, I finally hit on the idea of cutting apart about a dozen shotgun shells, collecting all the lead shot, wrapping it up in saran wrap, and then stashing that inside the phone. That worked wonderfully. All that lead shot really weighs it down, and since it's all wrapped up in plastic, it doesn't rattle and gives it exactly that good "heavy" feeling that it should have. I really think lead shot is about optimal, since lead is the densest metal you're likely to find just lying around, and with shot wrapped in plastic you have a flexible, non-conductive surface that will not affect a circuitboard. If you don't have a bunch of shotgun shells to cut apart, lead fishing sinkers would also work quite well I imagine. You might even be able to pack more of them in there, and get an even heavier phone! It turns out that the heavy mod is cool, but if you use the brick is a primary, it gets to be kind of annoying. The brick already takes up your whole pocket, and then it weighs 2.5 pounds instead of 1 pound. I ended up taking out the extra weight to make it easier to carry around.